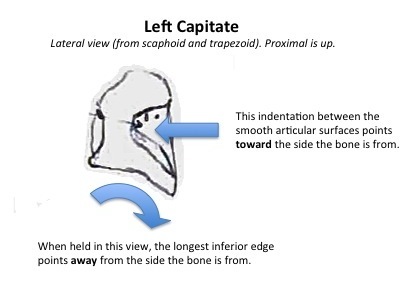 Like all carpals, the capitate possesses a distinctive, irregular shape that makes it easy to identify and side. Unlike the other carpals, however, the capitate happens to look like one of the most notorious villains in cinematic history: Lord Voldemort…Just checking that you’re paying attention! 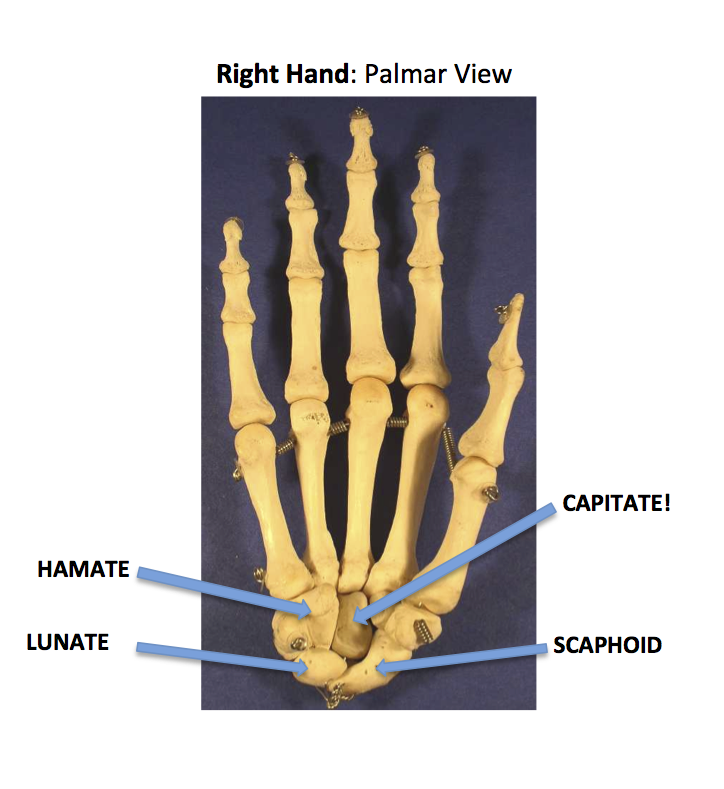 The smooth, rounded head of the capitate (for articulation with the lunate & scaphoid) is particularly difficult to confuse with any other carpal, and it provides a dead giveaway that you’re dealing with a member of the distal row of carpals. Siding Tricks: In order to orient yourself, the “helmet” (aka rounded articular surface for the lunate) will always be proximal. 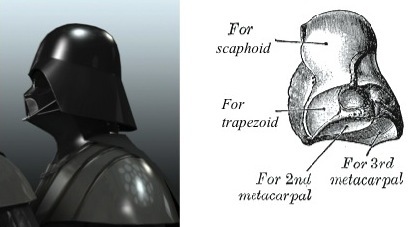 If you want to use the medial or lateral articulations to side the bone (for the hamate or the scaphoid + trapezoid respectively), orient the bone so that the helmet is pointing up, much like you’re looking at Lord Vader in profile. Then, rotate the bone so that the lateral surface faces you. Two articular surfaces should be visible: an upper, rounder one for the scaphoid, and a lower, more horizontal one that slopes off to one side, for the trapezoid. The non-articular indentation between these will point towards the side the bone is from. The lowest border of the bone will point down and away from the side the bone is from. Or, as one of my friends memorably told me at Kampsville, the bone is from the direction that Darth Vader is facing. For your further edification, two important Vader-Related links. And, since I suppose Vader had wrists, broadly speaking we can consider these carpal-related also. At least you can, if you need to justify a YouTube break as some form studying. As an adept-level graduate school procrastinator, I myself have no need of such excuses. 1. The Vader Sessions: Just open it. Trust me. 2. Death Star Canteen: Eddie Izzard on one of life’s universal equalizers….the cafeteria line. Original undoctored images found here: 1 & 2 & 3. This entry was posted in Carpals, Hand, OsteoMenagerie, Siding Tricks and tagged capitate, Carpals, siding carpals. Bookmark the permalink. OK, now I know how to side it … but which one is the DARK side? Whatever side it is that insidiously shelves the decaf Nescafé right next to the regular coffee…. I also saw “Darth Vadar” in the Capitate bone!!!! 🙂 The way I side it is similar to the bottom picture you use, the one above the siding section with the hamate articulation facing you. This way the “flare” of Vadar’s hood angles towards what side it’s from. And as I said before, your blog is so helpful! Thanks Nicole, and may the force be with you! If you’re studying the bones of the hand and foot I have a few other tips you might find useful – you can use the drop-down categories menu on the main page to search for any previous posts on carpals and tarsals.